Wells Fargo has more than 6,000 branches across 39 states. That's roughly 1,000 branches more than any other bank in America. The vast Wells Fargo branch network hasn't buckled much in recent years, even as rivals have pulled the plug on these expensive locations due to a profound shift toward mobile banking. 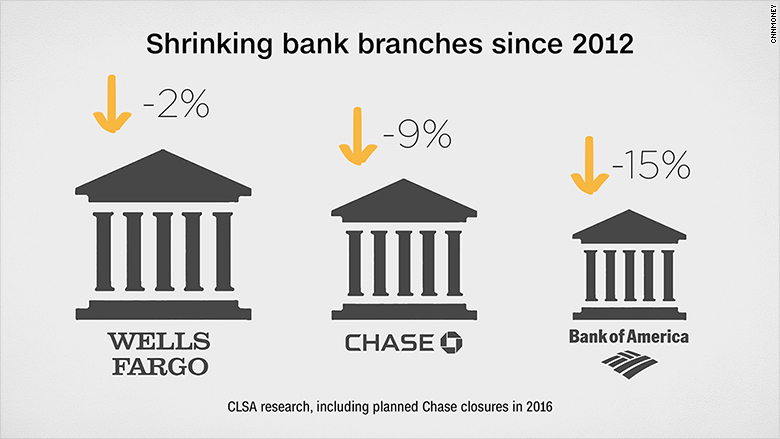 Since 2012, Wells Fargo's branches have shrunk by just 2%, compared with 9% for JPMorgan Chase (JPM) and 15% for Bank of America (BAC), according to CLSA. Wells Fargo hasn't announced any wide-scale branch closures in the wake of its massive fake account scandal, but the crisis may eventually force the bank to do it. Not only does Wells Fargo need to find ways to pay for mounting legal and compliance costs linked to the mess, but the once-reliably profitable branches may not make as much money now. That's because the bank's wildly unrealistic sales goals, which employees say led to the creation of as many as 2 million fake accounts, have been scrapped. "Whether Wells Fargo realizes it or not, they're going to be closing 1,000 branches," CLSA bank analyst Mike Mayo told CNNMoney. "It's a matter of when, not if." Mayo took it a step further, arguing that the need to maintain Wells Fargo's costly branch network "could have contributed to pressure on staff to sell more." The old game plan, which Wells Fargo seemed to execute quite well, was to attract customers into branches and then sell them as many products as possible. But "cross-selling" has since become a dirty word. The company said its branch count has declined by 115 since September 2012. By comparison, Bank of America's has shut nearly eight times as many branches. Wells Fargo hinted at branch closures during a presentation for analysts last week. The company said a renewed focus on mobile and online banking "will allow us to review our branch footprint for consolidation opportunities." However, new CEO Tim Sloan said, "I wouldn't be focused on branch closures." "We just spent 30 minutes talking about what's going on at the company. We've provided a tremendous amount of details," Sloan told Mayo. "If that doesn't satisfy you -- I'm sorry." "They're starting to realize retail branches are expensive, and maybe we don't need a Wells Fargo branch at every corner," said Miller. "They're in a dilemma though. It's very difficult to sell products online." Eric Wasserstrom, an analyst at Guggenheim Securities, said it's too early to tell what Wells Fargo will do but eventually the company may need to revise its retail banking model. Don't expect any big announcement on branches just yet. Not only is Wells Fargo grappling with an long list of investigations, including a new one launched this week by California, but it is conducting an internal review into the scandal. 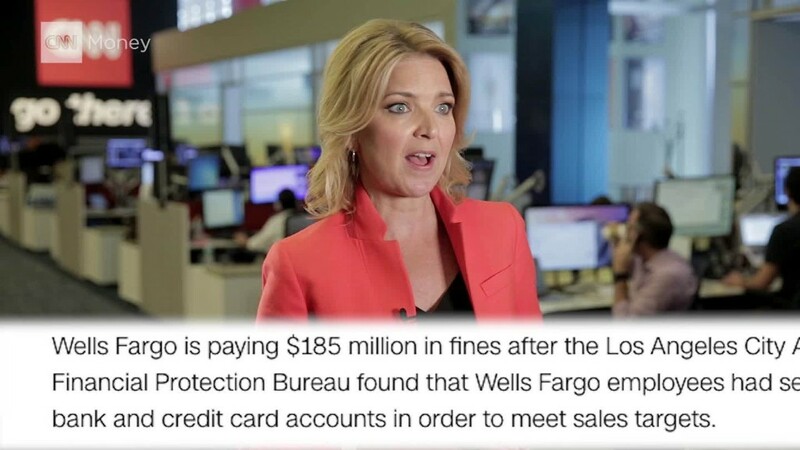 The review was launched by Wells Fargo's independent board of directors and is being run by Shearman & Sterling, the law firm that helped JPMorgan clean up after the 2012 London Whale mess. "Senior management is in crisis mode. They've still got to figure out how to get back on everyone's Christmas list," said Miller.